Starring Ben Affleck, Joanna Going, Rose McGowan, Peter O'Toole & Liev Schreiber. This film is on the Worst of 1998 list. "Phantoms"
Either fright writer Dean Koontz is a hack, or his novel "Phantoms" has been adapted by a hack. I haven't read any of the career suspense novelist's books, but after seeing "Phantoms," which he adapted for the screen from his own thriller, I beginning to think I haven't missed anything. I mean, the alleged terror in this movie, about a small Colorado town in which everyone has died overnight, turns out to be (insert violently shrieking violin music here) a morphing, sociopathic, subterranean oil slick that thinks it's Satan. No kidding. A high tech version of the Blob, this supernatural baddie with delusions of grandeur apparently sleeps in the bowels of the Earth for centuries, emerging every few hundred years to gobble up small towns. It's name is -- get this -- "the Ancient Enemy," and when it eats brains (which is does a lot), it absorbs the knowledge therein, making it allegedly very clever. The only thing that kept me walking out of this clunker after 20 minutes was my date, who wasn't quite as appalled as I was at the prospect of another 70 minutes of this crap. The story: Lipstick-doll sisters Joanna Going ("Inventing The Abbotts") and Rose McGowan ("Scream") return to their mountain hamlet from Denver to find everyone dead. After an opening scene marathon of horror clichés (creaking floor boards, dead phones that still manage to ring when killers are calling, severed heads, unreliable electrical lights, cars that won't start, etc., etc. ), the girls find a few sheriff's deputies that have survived and hunker down in the police station to wait for the army to come rescue them (their S.O.S. was the last phone call to go through). Meanwhile the army's supernatural unit (didn't know they had one, did you?) recruits supermarket tabloid reporter Peter O'Toole to brief them on "the Ancient Evil," his pet project, and they drive into town in a huge, armored biological warfare laboratory. O'Toole seems positively embarrassed to be a party to this garbage and speeds through his lines in a monotone with all the enthusiasm of a bus driver announcing stops. Told "we're not interested in the tabloid stuff, we want the science" (hardy har), he nonetheless proceeds to credit the oil slick with all kinds of historical mysteries, including the disappearance of both the Roanoke colony and the Mayan civilization. 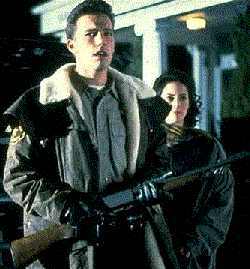 Not long after the military arrives, "Phantoms" turns in to a laughable "Night of the Living Dead" remake, with army-fatigued zombies terrorizing the tight sweater girls and the handsome young sheriff, played by Ben Affleck ("Chasing Amy," "Good Will Hunting") in an enormous career misstep. Directed by Joe Chappelle ("Halloween 6"), "Phantoms" employs every hackneyed horror technique in the book, including unnecessary camera zooms and lights that go off with a Earth-shuddering thud instead of a click, like light switches do in real life. The screening of "Phantoms" I went to had a small audience that loudly vocalized numerous suggestions for how the characters might get out of the town alive, if only they weren't so stupid. This interactive element was the only thing that made the movie even remotely tolerable.